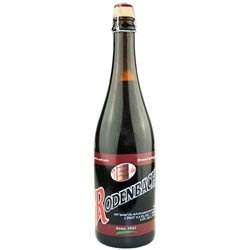 Rodenbach is a sour ale blend of 1/4 aged "mother beer" - which has matured in oak at least two years - with 3/4 of a younger, sweeter counterpart. A great introduction to the Flemish sour ale style, the brew pours a hazy brown color with auburn highlights and a small beige head. Aromas include sour cherry, vinegar, dark berry, green apple and grape with notes of sour candy, caramel and coffee. Taste is not quite as tart as the nose but follows the same general profile and also includes red currant, fig, raisin and spice with notes of wood, vanilla and red wine. 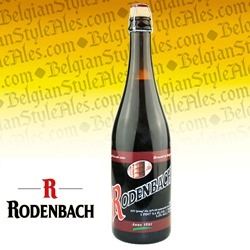 The mouthfeel is medium bodied and very smooth with active carbonation and a moderate 5.2% ABV. The finish is tart and dry. Pairs well with fish, shellfish, sushi, mushrooms, pasta and cheeses; or try with roast chicken and vegetables with crusty baguette on the side or even strong game meats. Serve at 6-8 degrees C.